The first time you open Safari on your Mac, the Apple website appears because it’s set as the default home page. Subsequent times you open Safari, the website you were browsing when you last closed or quit Safari (or shut down and restarted your Mac) reopens. You can change your Safari home page to whatever you want — even a blank page, if that’s what you prefer. These step-by-step instructions are given for Safari. Just keep in mind that other browsers (Firefox, Chrome, Internet Explorer and so on) work in relatively similar ways. Click in the Search and Address field at the top of the Safari window and type the address of the web page you want to use as your home page. If you have set the page as a bookmark, you can just click the bookmark to open the web page. Choose Safari→Preferences and click the General button on the toolbar. The website address of the page you are viewing automatically fills the Homepage field, as shown in the figure. You can also skip Step 2, go directly to Safari General preferences, and type the URL in the Homepage field. 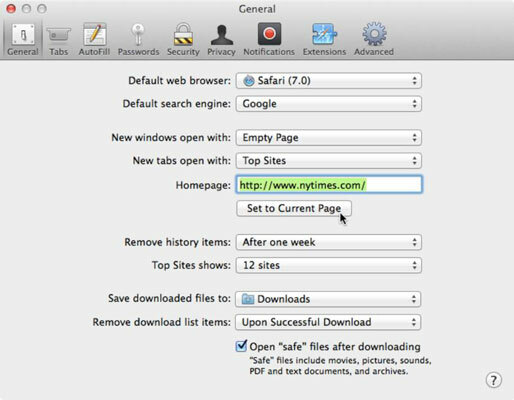 If you want Safari to open to your home page or a blank page when you restart or reopen Safari (instead of opening the most recent web page you visited), choose Homepage or Empty Page from the New Windows Open With pop-up menu. Close the Safari preferences pane.